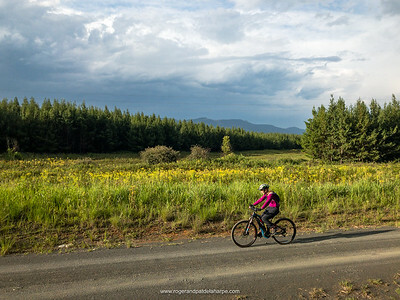 Mountain Biking - Easy Karkloof Ride - Roger and Pat de la Harpe Photography - Photographs, Video and Stock Images. The mountain biking in the Karkloof in KwaZulu Natal, South Africa is amongst the best in the country, and some say, the world... Whatever it is, it's a damn fine place to ride a mountain bike, with a number of trails of varying lengths and difficulty, laid out by the Karkloof Mountain Bike Club (part of the Karkloof Country Club). While these are great trails there are a myriad of other forestry roads and tracks that one can explore, like the one we did recently. We stayed on forestry roads, avoiding single tracks and technical sections and apart from the initial climb (check out the route profile) it's pretty easy and rideable even for those putting a toe in the proverbial waters as it were. The climb out from the Karkloof Club is a bit long but manageable and worth the effort. Download the GPX file here. 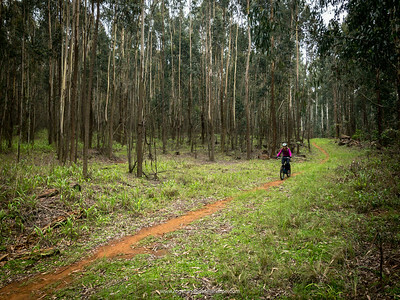 If you are not a member of the Karkloof Mountain Bike Club there is a fee of R50-00 per rider and, if you are feeling a little peckish post (or pre) ride, Steve's Bistro at the club offers wonderful coffee, cappuccinos and a variety of snacks and light meals (the breakfasts are particularly good).